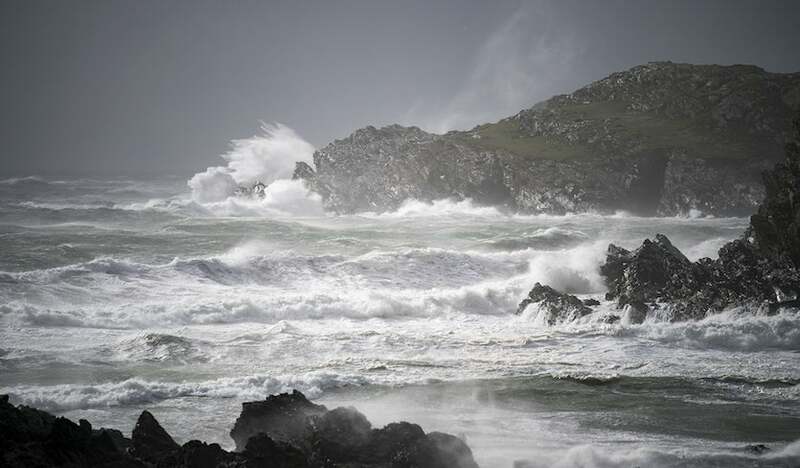 Above: Waves whipped up by the wind of Hurricane Ophelia crash against the rocks on October 16, 2017 in Holyhead, Wales. Hurricane Ophelia comes exactly 30 years after the United Kingdom's Great Storm of 1987. Two people have been killed as the remnants of the storm hit the U.K. and Ireland. (Photo by Christopher Furlong/Getty Images). Ex-Hurricane Ophelia hit Ireland hard with full hurricane-like fury on Monday, bringing powerful winds that caused widespread damage and power outages. At least two deaths have been reported from trees falling on cars, and The Irish Times said at least 360,000 ESB Networks customers lost power in Ireland because of the storm. Ophelia’s center crossed the southwest coast of Ireland near 11:30 UTC Monday (12:30 pm local time), just 12 hours after the National Hurricane Center stopped issuing advisories on the Category 1 hurricane. NHC’s last advisory at 11 pm EDT Sunday gave top sustained winds of 85 mph to the storm, and ex-Hurricane Ophelia weakened only slightly before making landfall on Monday morning in Ireland. 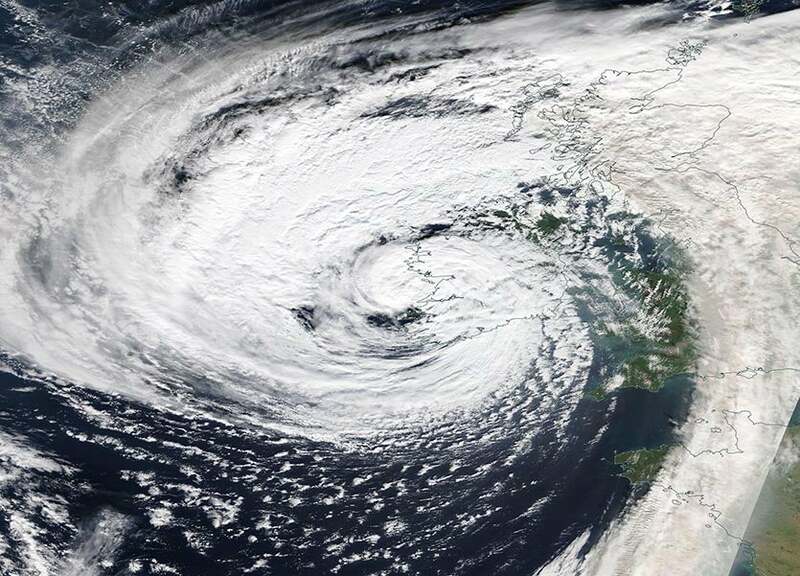 The storm took only about four hours to cross Ireland, and emerged from the north coast at approximately 15:30 UTC (11:30 am EDT) Monday. The eye of the storm passed over Valentia Observatory in Co. Kerry. Graphic of MSLP (pressure) below. Figure 1. Radar image of Ophelia over Ireland at 9 am EDT (13 UTC) October 16, 2017. 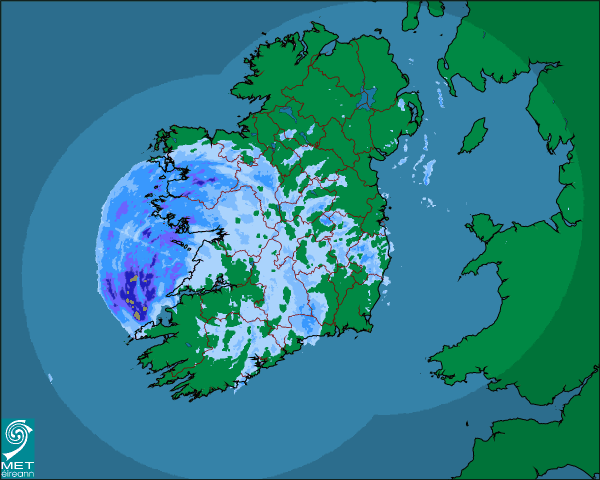 Image credit: The Irish Meteorological Service. 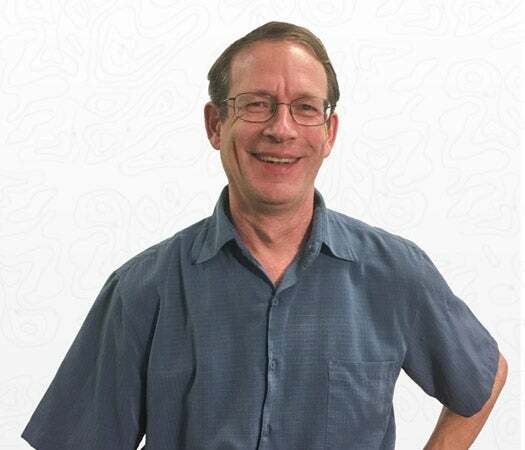 A long loop of the radar has been saved by Brian McNoldy. Ophelia brought a storm surge that breached coastal defenses and flooded roads in Salthill on the western coast of Ireland, according to this video. The surreal experience of a hurricane-like storm in Ireland was made even more strange by being preceded by an eerie sunrise that brought a hazy, orange sky across much of Ireland and Britain. The orange light was filtering through a thick layer of Saharan dust that had been transported to the north by the trough of low pressure that steered Ophelia northwards. Adding to the haze was smoke from wildfires in Portugal and Spain that killed at least 32 people over the weekend. Ophelia’s ascension to Category 3 status and subsequent impact on Ireland just 12 hours after becoming an ex-hurricane was made possible, in large part, by unusually warm ocean temperatures that were 1 – 2°C (1.8 – 3.6°F) above average. As the planet continues to warm due to the effects of human-caused global warming, we should expect to see more hurricanes maintaining their strength far to the north, allowing them to draw very close to Europe. 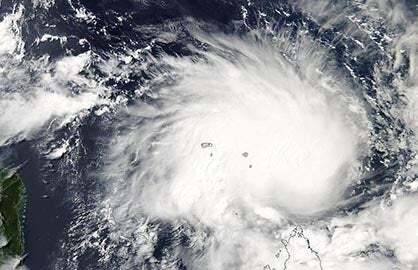 According to a 2014 study led by University of Wisconsin hurricane scientist Jim Kossin, "The poleward migration of the location of tropical cyclone maximum intensity", there has already been a “pronounced poleward migration in the average latitude at which tropical cyclones have achieved their lifetime-maximum intensity over the past 30 years. The poleward trends are evident in the global historical data in both the Northern and the Southern hemispheres, with rates of 53 and 62 kilometres per decade, respectively.” The scientists hypothesized that this poleward shift could be linked to the expansion of tropics poleward that has long been predicted as a likely consequence of human-caused global warming. They noted that so far, though, the poleward trend observed in the Atlantic tropical cyclone database has been small. One other way we know that Ophelia was an extremely unusual storm is that it broke some of the graphical displays we use to view the forecast. The National Hurricane Center graphical forecasts of the storm’s track had to be truncated east of 0° longitude (the Greenwich Prime Meridian), since they never planned for the possibility that an Atlantic hurricane or its identifiable remnants could make it so far to the northeast. Figure 3. Visible satellite image of 92L as seen at 11 am EDT Monday, October 16, 2017. A closed center of circulation was attempting to form to the north of the Turks and Caicos Islands. Image credit: NOAA/RAMMB. GOES-16 imagery is considered preliminary and non-operational. 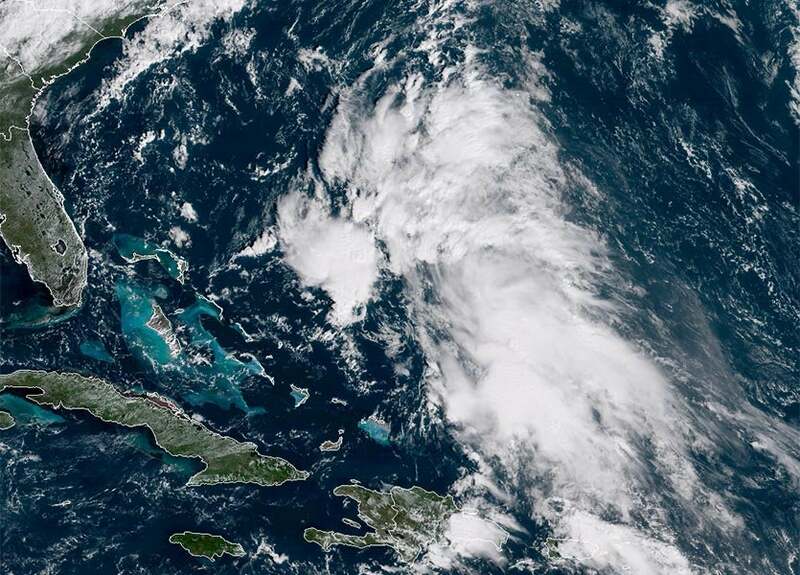 A broad area of low pressure was located about 200 miles north of the Turks and Caicos Islands at noon Monday, and was headed north at about 15 mph. This system (92L) has the potential to develop into a tropical depression by Tuesday night as it moves near Bermuda. No other land areas are likely to be impacted by 92L, but long-range model runs predict that the remnants of 92L will be absorbed by a powerful extratropical low-pressure system later this week, which will go on to give Ireland another battering on Friday and Saturday, as a 960 mb low-pressure system. 92L was under moderate wind shear of 15 – 20 knots on Monday afternoon, but had ocean temperatures warm enough for development: 28°C (82°F). Relative humidity at mid-levels of the atmosphere as analyzed by the 12Z Monday run of the SHIPS model was favorable for development, about 70%. 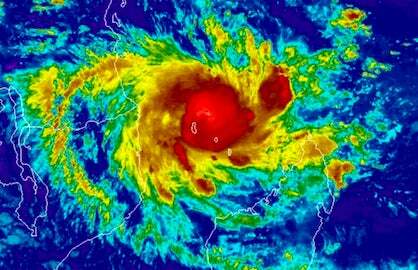 Satellite loops showed that 92L had a modest area of heavy thunderstorms that were slowly becoming more organized, with a surface circulation attempting to form to the west of the heaviest thunderstorms. The 0Z Monday runs of our top three models for predicting tropical cyclone genesis--the European, UKMET and GFS model--had one of them, the UKMET model, predict weak development of 92L by Tuesday. Approximately 40% of the 70 members of the 0Z Monday GFS and European model ensemble forecasts showed development of 92L into a tropical depression. The 12Z Monday run of the SHIPS model predicted that wind shear would rise to 35 knots by Wednesday morning as 92L merged with a cold front, which gives the storm a short window for development. In their 8 am Monday Tropical Weather Outlook, NHC gave 92L 2-day and 5-day odds of development of 40%. The Bermuda Weather Service is advising that 92L will bring strong winds and heavy rain to Bermuda on Monday night and into Tuesday.